Processing a hog at home certainly takes time, but it’s not difficult. We process all of our home-raised meat here at the farm. 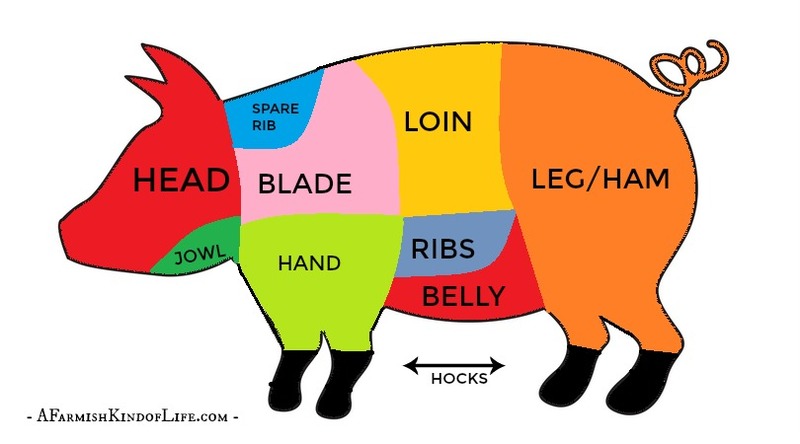 A common question we get when doing large animals is how do you know what cuts of meat come from where on the animal? Hopefully I can help clear that up for you with this post. 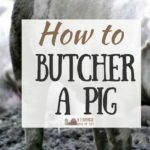 If you’re looking for information on the first part of the pig butchering process (dispatching, skinning, gutting, halving, and hanging) you can find that by reading my post How to Butcher a Pig. If you’ve ever processed another large animal (like a deer), don’t stress! You’re going to have an advantage going into this process. In many ways, a pig is just like any other large animal you may have already worked with. To make the cuts of meat properly, it sometimes helps to have a vision of how a pig is put together. Thanks to my son for making this lovely graphic. Now that you understand that, let’s do this! Before you get into the cuts of meat, you’ll want to make sure you’ve got a super sharp set of knives to work with. We like this processing kit by Outdoor Edge, and we keep the knives sharp with this electric knife sharpener. Before you make those cuts of meat, get to work on that pig fat! With the right tools, you can now start by trimming off some of the pig fat. The breed of pig and how large you’ve allowed them to get will determine how much fat is on your pig. Don’t get rid of that fat, though! That’s what you can make lard with! Cut off hunks of fat and package it for the freezer until you’re ready to render lard. We double bag all our fat in thick garbage bags, put the bags in a cardboard box, and then put the box in our chest freezer. Let’s get to the cuts of meat already. Ready to do this? Let’s get half a hog on the table. First, we separate the front shoulder from the ribs. Then we will do the same with the back leg. Here you can see the hog separated into front shoulder, middle section (ribs, chops, and belly) and back leg (the ham). Next, separate the chops from the belly. We’re starting to see some of the pieces! This, my friends, is where the bacon comes from. The ribs need to be separated from the bacon “square”. The ribs are on top of the bacon. ..and here is my husband’s hand, proudly laid on one giant slab of bacon! I’d say he’s got every reason to be proud! There is nothing like homemade bacon from a home-raised pig! …and used the meat saw for cutting through the bone. Well, lookee there at that! Update: We no longer cut bone-in pork chops. And oh-my-word, these pork chops had a lot of fat left on them! Suffice to say, we learn something new every year. For the front shoulder and back legs, we chose to cut smaller roasts instead of giant hams. To do this, you just get your hands in there and follow the major muscle groups. Feel around for the natural separations in how the muscles are put together. Follow the separations to make roasts. You’ll end up with hunks of various sizes. If you’re worried about where to cut, remember—it all tastes the same after it’s cooked. … and separating it into muscle “globs”. If you don’t want all of that “roast meat” as roasts, you can certainly chunk it up for stew meat, or grind it to be packaged as plain ground pork or mixed up with some seasonings to make Italian, breakfast, or spicy sausage. After this post was first published, we added a stainless steel electric meat grinder to our set up, and it’s awesome! In case you’re wondering, we wrap all of our cuts of meat in double layers of freezer paper—we buy the BIG ROLLS. And I’m always sure to add little sayings to each package. It’s always fun to smile when you read the package later in the year. Now you have pork chops and ribs, as well as roasts (which you can totally cure, smoke, and turn into ham). You’ve also got a slab of belly meat that’s ready to be turned into bacon. You’ve got a pile of pig fat to render as lard. You’ve probably got some scraps too which can be ground with leaner meats like venison. And remember—that was only half of your hog! Take a break, and repeat the process! Excellent post and good photos! When we first moved to the farm, I raised and butchered hogs. Now, that's too much meat for just me so I buy meat from a neighbor. I surely love knowing where my food comes from! Glad you liked it! It's really hard to explain things in words, so I'm glad I had pictures to go with it. I still think a video would be better. It's definitely something you have to DO to figure out HOW to DO it! Have you seen the new cookbook in Grit all about cooking and baking with lard? I keep thinking I should buy it but I don't know where to get any lard besides the grocery store and I don't want to use that. Yes I have seen that cookbook! I think I should get myself a copy. 🙂 I have never used store bought lard…I imagine it might be something like store bought goats milk…which just…well…nevermind. Cuts of meat have always fascinated me. Love seeing where they come from. It's kinda like a puzzle that only certain people know how to put together (or take apart really). I love lard! My dad and I rendered it together so he could show me how it was done. I use it in all sorts of baking and to season my cast iron. Waaaay better than the storebought stuff. You are amazing! Better than money in the bank! Thanks for doing these posts, you have a wealth of information and photos to go with – awesome! I was happy to be able to do them. I think when you finally figure out how to do something, you have a responsibility to pass on that knowledge. 🙂 That's how we all figure things out, right? Thanks for reading! Wow, what alot of hard work, but totally worth it, I'm sure! Oh gosh. We're doing this Sunday, and I'm doing all my research now to prepare. This is our first "big animal" slaughter–although our pigs are a small breed, with a slaughter weight of 100lbs instead of 400. But boy, are they going to be good! Wow, you guys make it look easy!!! We talked about doing a pig one year… but would probably take it to our local butcher for processing because they only charge $30 for doing so. And holy cow, how would we do it without a skid steer?!? Haha! Great post and you did a great job presenting the work– REALITY at it’s best. Looks great! Thanks for taking the time to share it with us! I liked your post. Have got a fair amount of experience at this – started as a young boy. Doing 3 hogs next Saturday with young first timers. Always feel a little crude about how I cut roasts – but I see you do it the same – yay! I also do my chops boneless and no longer split the hog in half. I hoist the carcass up by the hind legs and remove the front quarters, then the chops, then I take off the meat of the hind quarter leaving the leg bones hanging. Last i use a recip saw to cut the ribs off. Finish with the tenderloins and removing any scraps of trim on the bones. I use the belly (bacon) and trim to make breakfast and sweet Italian sausage – its the best. Thanks again. I like how you said you write on your butcher’s paper to read later in the year. My dad uses a mobile butcher to process his meats. 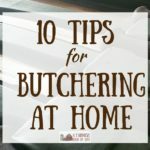 Thanks for the guide on how to butcher at home.